Simon & Schuster, 9781501115578, 416pp. "Mitchard's latest novel explores the fascinating question of those who have extraordinary gifts, what responsibility comes with those gifts, and where the line of morality falls between those poles. A thoughtful, sweeping read." 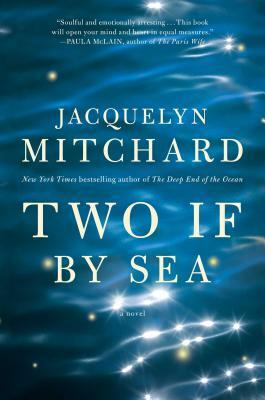 "Soulful and emotionally arresting, Two If by Sea is somehow both a startling departure for Jacquelyn Mitchard and the deepest sort of coming home. With the intertwining fates of Frank Mercy and the mysterious, exceptional foundling, Ian, Mitchard masterfully mines the place where catastrophic loss meets near-impossible hope and healing, and where ordinary love and sorrow meet the most extraordinary interventions. This book will open your mind and heart in equal measures." "A day after losing his wife and unborn child in a tsunami in Australia, American Frank Mercy rescues a mysterious young boy from the floodwaters. What happens next offers Mercy the opportunity to heal his new wounds while opening old ones. This sprawling family saga is a lot of things - a finely drawn character study, a transcontinental thriller, a portrait of grief and loss - but, most importantly, it is a very, very good book. Although it brings to mind the work of writers like Gail Godwin and Richard Flanagan, this is the kind of novel that only Jacquelyn Mitchard can write: a literary page-turner that is as propulsive as it resonant, as hard to define as it is to put down." "With grand landscapes, deep emotions, harrowing adventure, and genuine characters who aren¹t characters at all but people about whom we come to care so very much, Two if by Sea is a powerful blockbuster of the first order. There is magic here, both in terms of the vast story told, and in Ms. Mitchard¹s always-beautiful writing. This is a riveting book, a gift to readers everywhere who want to sink into a novel of history and love and grace and magic." "Like all good novels, Two If by Sea works on two levels. There's an exciting adventure story. And beneath that is a meditation on family, loss, and recovery....It's a great story. And powerfully written....a love story that kept me reading long after I should have turned off the lights."